People do strange things when they’re desperate to be heard. They might say something outrageous, act inappropriately, or provoke someone into a reaction. When it comes to marketers and their content, this dynamic can get even weirder. We’ve all seen so-called “professionals” trying to outshout each other like hyped-up kids at a birthday party, getting louder and crazier as they try to grab buyer attention. From publishing hard-line content to making outlandish promises, the carnival barker school of content offers plenty of gimmicks that sound bold in theory but just look idiotic in practice. Or perhaps the worst of all of these offenses: It makes marketing sound easy. At the same time, I get it. We’re all trying to be heard. We’re creating campaigns and writing web content and trying to persuade buyers. And given the rapidly evolving digital landscape, it’s hard to know what’s effective, what’s powerful, and what hits that sweet spot of getting heard above the crowd while staying credible and appealing. The thing is, this dilemma goes both ways. People want to hear genuine wisdom, fresh ideas. They’re not intentionally ignoring your voice. There are just too many marketers screaming to be heard—which means you have to market smart, not loud . 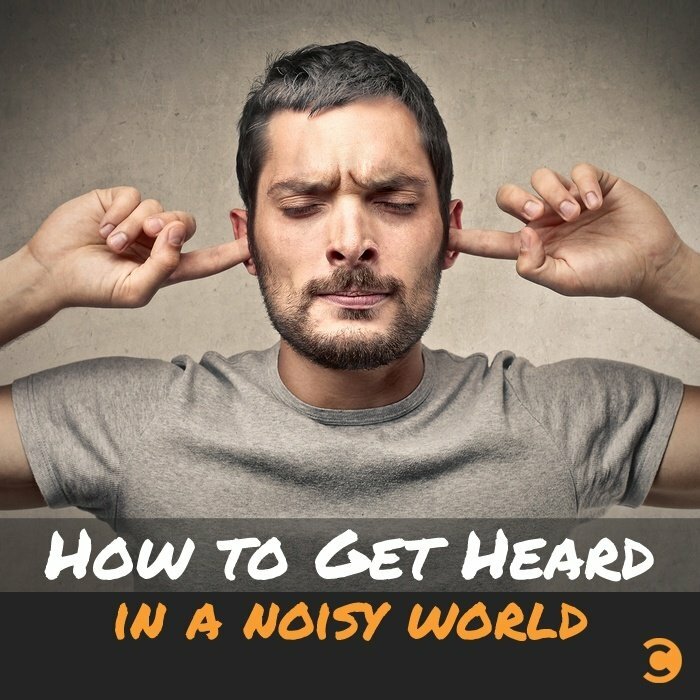 Here are my five guidelines on getting people to listen to you in a noisy world. People are busy, which is why they want to aggregate their news in one source. They don’t have time to visit a dozen outlets each day, and they probably won’t be swinging by your blog that often. Why? Because people are congregating in the village square, and your blog is more like a distant outpost. In digital terms, that village square is social media. That’s why most brands aggregate their content on Facebook and other platforms these days: People turn there for business news because their friends, colleagues, and favorite leaders are there in one place. If you think you’re site is where your buyers eyes are, you’re mistaken. How many of your social connections do you really know? As the saying goes, the Internet has democratized the distribution of content without democratizing talent. Keep that in mind when curating your online universe. Connect to good people, and you’ll get good information. But if you fill your network with just anyone, you’re going to sort through garbage to find the gold. Instead, follow smart people who post interesting items. Start with the obvious suspects—the movers and shakers, the trailblazers—but don’t just play follow-the-leader. Surround yourself with people who fascinate you, even if they don’t immediately connect to your end game. You’ll come away inspired, and that will energize your output. How obvious, right? Except a stunning number of marketers still aren’t doing it. They’re churning out content based on nothing but their own loose ideas of an audience. In the competitive jungle we call marketing, that’s the road to failure. Serious marketers capture abundant data—and there’s no excuse for not doing it with all the advanced tools on the market like Madison Logic Data—and sculpt their content accordingly. They identify the right topics and conversations. They segment by persona. They hone in precisely as a missile and make an impact. True story: I knew a business owner who really wanted to land a deal with a specific enterprise company. He saw the CEO tweet that he’d traveled to a conference without his trusted piece of technology, so the business owner had one shipped to him with a personal note. Now, you’ll find plenty of so-called experts who applaud this as a creative move, but let’s be real. The CEO wasn’t going to be so impressed that he immediately reached out to the business owner; he probably filed it away under “trying too hard” and forgot him. Send something that ties into your business: valuable content. I really like the CEO in this example, but I hate stunts. It’s something of a cliché now to talk about authenticity and the importance of building trust. Well, it’s a cliché because it’s true: Trust is the top factor when it comes to getting heard. If your mind is only on revenue, stop—that’s 25 steps down the road. Your first priority should be making sure your content persuades buyers to view you in a different light than every other business on the web. You see it every day. Someone recommends doing business with a person, and the first question is, “Do you actually know this person? How well?” People know there are plenty of hustlers and second-rate vendors out there, so they want to connect with someone they can trust. This is why the standard ploy of offering a gated ebook or white paper in exchange for data just doesn’t work anymore. Without any trust established, leads don’t see the value in it. Next time you want to be heard, let others shout themselves hoarse. With an intelligent foundation, you’ll be the marketer version of President Roosevelt’s “Talk softly and carry a big stick”—creating content that gets listened to because of the value and strength it brings to the table.